For all boat owners, an understanding of lead-acid batteries is important to optimizing the reliability and performance of the boat’s DC electrical system. This article introduces some important concepts in order to enable further reading in boating publications, magazines, websites and Internet posts. This article has no math, and only conceptual references to battery chemistry and physics. It is essential to understand the rate at which different types of lead-acid batteries can be charged. For boaters, the subject has a direct bearing on battery and battery charger choices. Owners must also understand the importance of battery care, including routine monitoring of state-of-charge, battery electrolyte management, equalization charging, and related battery maintenance subjects. Good battery maintenance will avoid premature battery failure and maximize battery service life. Lead-acid batteries contain chemical energy in the materials of which they are made. Batteries release that stored energy in the form of DC electric current. The rate at which that energy can be delivered by a battery into an electrical load is stated in Cranking Amps (CA), Cold Cranking Amps (CCA), Marine Cranking Amps (MCA) and Reserve Capacity (RC). Deep-cycle (traction) batteries are typically rated in aHr returned over 20 hours (US measurement system; 10 hours is typical in Europe). Start service batteries are normally rated in CA/CCA/MCA and RC. The total amount of energy a lead-acid battery can release is determined by the physical properties of the battery materials, its construction, and the length of time over which the energy is drawn off. The technical details related to Charge Acceptance Rate (CAR) are quite complex, but there are some simple “rules-of-thumb” that illustrate and explain basic battery charging concepts. CAR is determined by battery materials and construction technology. The ill effects of incorrect charging (over charging and under charging) are extremely difficult to measure and may never be fully appreciated by retail battery buyers/owners. Boaters need to know that poorly designed charging systems can result in premature battery failure and shortened battery service life. Assume that the lead-acid house bank has been discharged to a point where between 50% and 60% of its total capacity is still remaining. In other words, 40-plus percent of the battery capacity has been “used,” and the batteries are presently at 50% to 60% State-Of-Charge (SOC). This condition is an appropriate and reasonable time to begin recharging the batteries. The CAR “rule-of-thumb” for flooded wet cells at 50% SOC is that they will accept 25%, stated in Amperes, of that cell’s aHr capacity. So, for a 100 aHr battery at 50% SOC, CAR would be 25A. That is, that 100 aHr flooded wet cell will accept a charge current of 25A, but no more. That 25A of charging current can come from a single battery charger or from several charging sources working cooperatively together. Similarly, the CAR “rule-of-thumb” for AGM and Gel cells at 50% SOC is that they will accept 40%, stated in Amperes, of the cell’s aHr capacity. So for a 100 aHr AGM or Gel cell at 50% SOC, CAR would be 40A. Indeed, some specialized AGM cells (Thin Plate Pure Lead) can accept larger charging currents, but the batteries found on most boats tend to be of types that cannot. An owner who has batteries that can take higher CARs would know that. The batteries are expensive, and owners would not install those batteries without knowing what they can do and why they’d want/need them. Just because a battery has a theoretical CAR does not make charging at that rate the right thing to do. Rules-of-thumb are useful for learning and understanding concepts. Battery owners should verify the manufacturer’s ratings for their particular batteries. Batteries do have different specifics. Lifeline, for example, specifies lesser than “rule-of-thumb” maximum CAR, and for good reason. For lead-acid batteries, the positive and negative lead plates are composed of two different forms of lead: pure lead and lead dioxide (lead dioxide is also called “sponge lead” by some authors). Lead-acid batteries release electric current in a chemical reaction that converts lead and lead dioxide into lead sulfate and simultaneously, sulfuric acid into water. In that chemical reaction, free electrons are released. Charging a lead-acid battery is the process of recombining the lead sulfate and water back into lead/lead dioxide and sulfuric acid. Lead is a crystal lattice metal. In the recombination, electrons are restored to the structure of the crystal lattice of the metal. In the “bulk” stage, the charging source maximizes the charge current to the level the batteries/bank can accept. Battery terminal voltage starts out low, and slowly increases to it’s pre-determined setpoint as SOC increases. In the “absorb” stage, terminal voltage is held at a pre-determined level, and charging current decreases as SOC continues to increase. In the “float” stage, terminal voltage is held slightly above the battery’s resting voltage and a very small current trickles through the battery. The “equalize” stage is a short duration, occasional, over-charge performed on a fully-charged battery. I recommend that charging systems be designed to result in charge rates that are slightly less than battery manufacturer specifications for CAR. The reason is, with a partially discharged battery, the crystal lattice of the lead plates is depleted of electrons. Lead has been converted to lead sulfate and the plate surfaces are “etched” of material. During charging, it takes time for the conversion of lead sulfate back into lead and lead dioxide, and it takes time for electrons to equalize throughout the interior deep regions of the lattice of the lead plate material. If the rate of electron migration is driven to try to proceed above the maximum CAR, the process can result in a phenomena called “surface charge.” The surfaces of the lead plates of the battery can become electron-saturated even while the deep structure of the lead lattice remains electron deficient. Generally, electron migration rate-control is one of the key purposes of the “absorb” stage of the battery charging curve. to determine when to switch from stage-to-stage. If a battery is charged too fast by a charging source capable of “force-feeding” more current than the battery can accept, surface charge over-saturation will occur. Under this condition, electrolyte gassing will also occur. Worse than gassing (discussed later in this article), battery terminal voltage will appear to have reached a charger stage-transition setpoint, and a multi-stage charger can think that it’s time to switch into the next later stage of charging. For example, the “bulk” charging target voltage can be reached early, and the charger will then switch to “absorb.” This particular condition doesn’t have serious consequences, but it does prolong the overall time it takes to achieve full charge. However, the “absorb” charging current threshold can appear to be met prematurely. In that case, “absorb” can terminate early, and the charger can enter “float” prematurely. If absorb ends prematurely, the lattice structure of the plates will be in an only partially reconstructed (electron-depleted) state. Thereafter with the continuing passage of time, the excess surface charge that caused the premature stage switch will bleed into the deep lattice. Once electron equilibration completes, the result is that the entire lead lattice remains electron deficient. That is, in English, the battery is undercharged (not fully re-charged). That means some lead sulfate remains behind. Complicating the above, some experts now feel that the duration of the “absorb” phase in modern multistage chargers is not sufficiently long enough to fully recharge the battery, even when everything else is optimum. Because the volume of available lead sulfate decreases as the battery charges, the speed at which it’s conversion back in lead and lead dioxide necessarily slows. Some experts say that the final 15% of charge, from 85% to 100%, requires 8 hours. Shore power chargers that drop into float for long times can accomplish the same thing, but running on a genset at anchor, not so much. Effects of charging on battery service life. An example: assume a 1000 aHr flooded wet cell battery bank that is around 50% SOC; it’s theoretical CAR is 250A (25% of aHr capacity). A charging source controlled to drive only a “bulk” charge of 150A or 200a would avoid the build-up of excess surface charge, but a charger (or multiple charging sources working cooperatively) that drove to 400A would indeed create a massive surface charge that could result in a battery bank that is chronically undercharged while also needing a lot of electrolyte replacement. Realize also that in all lead-acid batteries, as SOC increases, CAR decreases. That is, the “internal resistance” of the battery’s “equivalent circuit” goes up. That also increases the possibility of excessive surface charge. The net is, charger selection and capability are extremely important. The charger and the charging program need to be able to sense battery behavior and compensate for changing CAR throughout the charging process. All battery banks of all sizes can exit the “absorb” stage early, wind up in “float” prematurely, and be chronically undercharged. If that happens on a regular basis, battery service life will be lessened. Battery charging is indeed a trade-off between what is actually best for the physics and chemistry of the battery and what the owner views as “best” or “necessary” for them in their daily lives. What’s best for the battery is to be fully recharged, and to be fully charged somewhat slowly compared to its theoretical maximum capability. Of course, that means increased generator run time for anchored boats. Many cruisers charge to the end of bulk and quit; that point is, as a “rule-of-thumb,” the “gassing” point, or about the 85% SOC point. Most cruising boaters have heard of re-charging in the range between 50% SOC and 85% SOC. That is not a strategy to maximize battery service life or return total lifetime amp hours. To achieve those goals, owners must do what is best for the batteries. Most battery manufacturers recommend fully charging batteries at least every 10 days to two weeks. A side benefit of solar charging systems is that they have lower charging capacities and do their work over longer periods of time; slowly. I recommend the use of a coulomb counter to monitor battery State-Of-Charge (SOC). One such legacy stand-alone coulomb counting device is the Xantrex Link10/Link 20, but it has some limitations. There are several aftermarket coulomb counters available today, such as the Bluesea Systems M2 DC (p/n 1830), Victron BMV-770 or BMV702, Xantrex LinkPro and Mastervolt BTM-III. I feel the best choice these days is to get a coulomb counting monitor from the manufacturer of the charger or inverter/charger. Aboard Sanctuary, a Magnum MS-Series Inverter/Charger is installed. I replaced my Xantrex Link 20 with a Magnum Battery Monitor, ME-BMK. Our monitor calculates Peukert effect and Charge Efficiency Factor (CEF) in real time. This is especially important for those who run AC appliances such as coffee makers, food processors, chopper/grinders, microwave ovens, vacuum cleaners, washer/dryers and such on inverters. These types of loads on the 120VAC side are very demanding on the 12VDC battery side. Heavy DC loads (thrusters, windlasses, winches and DC motors [watermaker “Clark Pump”]) also distort (lessen) the 20-hour rating of energy capacity that batteries can return. Many boaters rely on conventional DC voltmeters to track state-of-charge. Battery terminal voltage is a late indication of SOC. Particularly when large DC loads are involved, voltmeters do not provide a reliable indication of SOC. Conductance testers are great at measuring CA/CCA/MCA, but not so good at aHr. In my opinion, coulomb counters remain the best available alternative today. Recalling the purposes of the “bulk” and “absorb” stages of charging: “bulk” is a constant-current stage of large current flow (full-fielded alternator) that is targeted to take advantage of the Charge Acceptance Rate physics of the lead plates. “Absorb” is a constant-voltage stage that is intended to restore the electron equilibrium of the deep crystal lattice of the lead plates. However, electron replacement in the plates is only part of what’s going on inside the battery. The chemistry of the liquid electrolyte is also dynamic and changing throughout the recharge and discharge cycles. When flooded lead-acid batteries are fully charged, the “normal” mixture for the liquid electrolyte is approximately 35% sulfuric acid and 65% pure water, so the Specific Gravity (SpGr) of the electrolyte mixture is 1.265 at 80ºF. With flooded wet cells, SpGr can be measured with a hydrometer; it’s not practical to measure SpGr with sealed AGMs or Gels. The process of discharging a battery removes sulphur from the sulfuric acid to form a sulfate of lead. Timely recharging of the battery reverses that reaction. With the formation of lead sulfate during discharge, the percentage of sulphuric acid in the electrolyte mixture decreases and the percentage of water in the electrolyte mixture increases. The SpGr of the electrolyte mixture goes down. (Note: measurement of SpGr is the single most reliable measure of battery state-of-charge; perhaps not practical, but by far the most accurate). As a lead-acid battery begins to charge, the electrolyte is restored toward the 35/65% “normal” equilibrium mixture concentrations of sulphuric acid and water. During charging, there comes a point when electrons cannot move as fast into the lead lattice as the chemical process is capable of proceeding. That point is called the “gassing” voltage; or the point at which significant bubbling begins to appear in the liquid electrolyte; the electrolyte appears to be “boiling.” “Gassing” is the point at which hydrogen gas is given off to the atmosphere. At the gassing voltage, CAR is overcome by the build-up of surface charge; that’s when “gassing” begins. One result of this evolution of electro-chemistry is a drop in the liquid level of the electrolyte in the battery cell. Some people say “water has boiled off.” Not exactly, but that description is OK relative to the externally observable symptom. The liquid electrolyte level does go down, and if it goes far enough, the plate tops will get exposed. Another consequence of the gassing is that some lead sulfate remains un-reconstituted, so over time, battery capacity is diminished. The “gassing” voltage (or ideally, a voltage immediately below the gassing voltage) is the point where lead-acid battery chargers should switch from “bulk” to “absorb.” At that point, the battery is around 85% state-of-charge. One major system design reason for a charger to switch from constant current (bulk) to constant voltage (absorb) at that 85% level is to reduce gassing to a minimum. Implication: if there is an ongoing need to replace distilled water in the battery electrolyte mixture, the ONLY reason is that the charging source(s) is not switching from bulk to absorb at the most optimal point in the charging cycle FOR THOSE BATTERIES AT THEIR OPERATING TEMPERATURE. Other than a physical damage to the battery case, there’s no other reason to lose electrolyte. I believe flooded wet cells offer the best overall return-on-investment for boats that get a lot of use. AGMs or Gels are a better choice for boats that get relatively little use. Stratification is a phenomena that happens to flooded wet cells over a relatively long period of time (weeks) of disuse. As discussed above, the liquid electrolyte in lead-acid batteries is a mixture of sulphuric acid and water. Over time, the sulphuric acid and water components will settle in layers in the battery cell chambers (stratify), water “floating” on top of acid. Charge/discharge cycles set up convective circulation in the electrolyte mixture, so stratification does not occur when batteries are used. Boats also agitate the electrolyte mixture as jostle about in a seaway. Equalization charging also creates convection current which mixes electrolyte liquid. Boats at risk for electrolyte stratification are boats with flooded wet cells that get infrequent use, have high DC electrical demands, and have small charger capacity and/or are not recharged for sufficient time to achieve a full charge. Stratification in flooded wet cells is a problem for several reasons. Acid concentration at the bottom of the plates causes open circuit terminal voltage to appear higher than it actually is. Uneven distribution of the acid throughout the cell reduces CA/CCA/MCA and causes uneven plate etching. Sulfates on plates are not evenly reconstituted. Over long periods of time, these issues cause premature loss of capacity and lead to early battery failure. Charger manufacturers are different from battery manufacturers. Chargers from any one manufacturer will charge batteries from many battery manufacturers. Default charging programs make assumptions (via “rules-of-thumb”) based on averages for battery materials, construction and operating temperatures. Occasionally in real life, factory defaults must be tweaked. Not all flooded wet cells are the same; not all AGMs are the same. Balmar voltage regulators allow the setpoints for charging-stage voltage, stage duration and battery temperature to be adjusted. Most newer shore power chargers allow for some parameters to be adjusted. Many older technology chargers do not. Shore power chargers should be equipped with temperature probes for the batteries they charge. If the charger’s battery-type setting (flooded, AGM, Gel) is correct for the battery being charged, and batteries nevertheless continue to lose electrolyte, reduce the bulk setpoint voltage in steps of 0.1 volt and monitor the results. Electrolyte loss should decrease. Do that incrementally until full charging occurs with minimal electrolyte loss. The effect will be that it may take a few minutes longer to achieve a fully charged battery (total time from start-of-bulk through end-of-absorb), but there will be less electrolyte loss, less hydrogen outgassing, and more complete re-constitution of lead sulfate. These same processes occur inside AGM and Gel batteries. The difference is, because AGM and Gel batteries are sealed, it can’t be seen or measured. These batteries have pressure operated valves (Valve Regulated Lead Acid) that retain the outgassed hydrogen under pressure, and allow it to resorb into it’s electrolyte over time. That does work, to a point. However, it’s way better to avoid overcharging sealed batteries. For maximum return on service life, set charging parameters so that sealed batteries charge slowly. Especially so with Gels, because hydrogen gas escaping in gel cells can actually create gaps (channels) in the Gel, which can result in permanent loss of capacity in the cell. Equalization (called “conditioning” by some manufacturers) is the process of applying an intentional over-voltage charge to a battery. Because the battery to be equalized starts out fully charged, DC currents forced through the battery during equalization are relatively low. Equalizing is very hard on the mechanical structure of the plates and the plate support frames. It also causes aggressive release of hydrogen gas (gassing). These negatives are why very few AGMs, and no Gels, can be equalized. Battery and charger manufacturers recommend equalizing flooded wet cells only when the SpGr in resting cells differ from cell-to-cell by from 0.15 to 0.20. Measuring SpGr is not hard, but it is tedious. Achieving a “resting” state is impractical on most boats while batteries are in use. Lead-acid flooded wet cells are 2.2VDC each, so there are 6 cells in each battery of nominally 12V. A bank of three 12V batteries will have 36 individual cells. Only the most dedicated owners will measure the SpGr of 36 cells to determine if equalization is actually appropriate. Then there is the matter of, “how long to equalize?” Manufacturers recommend monitoring of cell SpGr hourly, with the equalization overcharging voltage being discontinued when the SpGr is consistently equal across all of the cells of the battery/bank. When the SpGr is equal across all cells in the battery, that is THE DEFINITION of “equalized.” That is the condition where the internal resistance and internal losses of each cell are identical, and balanced, so each cell carries a fully equivalent part of the total load. This state is reached after a variable duration of time, depending on the starting condition of the battery when the equalization process was begun. The net is, while there is real science and manufacturer’s recommendation on how and when to equalize, and when to quit equalizing, the tedious and inconvenient nature of “doing this right” makes this task ripe for shortcuts and dockside lore. It takes a lot of time to do it right; I assume, more time than most people are willing to invest. Can it be a good thing to do? Absolutely. Can it be a bad thing if it’s over done? Absolutely. This entry was posted in Batteries - Charging and Care on 2016/04/26 by gilwellbear. Question 1: Is it OK to combine batteries of different lead/acid construction types? That is, is it OK to combine wet cells with AGMs, or mix ‘n match wet cells, AGM and/or Gel cells? Answer 1: For short periods, like starting an engine in an emergency: yes. Regularly, long-term, “permanently:” no. NO! Discussion 1: All electrical devices, including batteries, possess the electrical property of “resistance.” The physics of resistance in batteries is more complex than the physics of resistance in a length of copper wire. Referred to as “internal resistance,” the resistance of batteries is a function of the chemistry, construction design, current state-of-charge (SOC), temperature and the cumulative damage done to the battery by its average and maximum discharge usage history, age measured in accumulated charge/discharge cycles, rate-of-discharge, and history of operating temperatures. Newly manufactured batteries of different construction (wet cells vs AGMs vs Gels) have different “natural” internal resistance characteristics. The internal resistance of older batteries is higher than that of new batteries. Combining batteries of different types guarantees they will not be electrically equivalent when combined. The imbalance will result in circulating currents caused by the differences in internal resistance and battery construction. These circulating currents will hasten self-discharge, internal sulfation and premature loss of capacity. Batteries of different construction charge and discharge at different rates. Question 2: Is it OK to combine batteries of different service class? I have a pair of flooded Group 31 starter batteries to start my engine and two flooded 8D deep cycle batteries to support my inverter bank. Can I keep my battery selector switch (Off-1-2-Both) set to “Both” all the time? Answer 2. For short periods, like starting an engine in an emergency: yes. Regularly, long-term, “permanently:” no. Discussion 2: Batteries used in “start” service should be labeled by their manufacturer as “start” batteries. Batteries used in “deep cycle,” or “house” or “inverter” service should be labeled by their manufacturer for “deep cycle” service. Start and deep cycle batteries have different internal electrical properties, and are not compatible as long-term peers in a combined battery bank. The difference between start and deep cycle batteries is not in battery chemistry, but rather in construction materials and technique. “Start service” batteries have a large number of thin plates that give up and restore their energy very quickly, while “house service” batteries have fewer but much heavier plates that give up and restore their energy more slowly. Start service batteries are not designed for, and should never be, deeply discharged. Because they are built with thin plates and lightweight separator frames, start service batteries will be permanently damaged with even a very few deep discharges. House service batteries are designed to handle the mechanical stresses that deep discharges apply to lead plates and plate frame construction. Question 3: Is it OK to combine batteries of the same service category and construction type, even if they are of different capacities? I have two flooded 8D start batteries and eight flooded 6V golf cart batteries for my house/inverter bank. Answer 3: In parallel, not recommended, but may be OK; in series, no; never. Discussion 3: Resting circulating currents in this situation are minimized because the battery technology is the same for both start and house bank. However, high currents – particularly large load and large charging currents – are not balanced in the bank due to voltage drop in the inter-connecting cables and differences in battery capacity. In parallel configurations, the lesser capacity batteries in the cluster will be “supported” by their greater capacity peers, and will become charged and discharged at approximately the same rate in proportion to their capacity. Question 4: Is it really necessary to replace all of the batteries in a bank at the same time? Answer 4: With only one exception, yes, that is what I recommend. Discussion 4: Batteries of the same type and capacity, connected in a bank cluster while performing similar service, age at approximately the same rate. I discuss this in a post on my website, here: https://gilwellbear.wordpress.com/category/boat-technical-topics/electrical-topics/battery-topics/battery-replacement/. No matter how carefully battery banks are managed, battery aging will occur. Over time, un-reconstructed sulfation will reduce plate surface area. Shedding of plate surface material will reduce the lead volume of plates, reducing overall energy storage capacity. Good management will only affect the rate at which the aging processes progress. Ignoring for now how the determination is made, let’s assume that one battery in a bank of three 12V, 8D batteries in “house” service (including a 3kW inverter) has been identified as having failed. There are two sets of questions that arise. First, questions around placing a new battery with low internal resistance into a bank of aged peers with much higher internal resistances. Second, questions of economics and convenience; i.e., when will another aging member of the bank cohort fail (week/month/quarter)? Where will the boat be when that happens? Will replacement batteries of the required capacity and type be available in that locale, or will they have to be shipped in? What will be the impact in boat operations if the bank fails? The answers to the economic and convenience questions will be unique to each boat and owner, but the fact is, the remaining still-serviceable batteries have aged and will fail at some point, relatively sooner than later. Question 5: How do I decide how much battery capacity I need on my boat? Answer 5: The rule-of-thumb: lead/acid batteries should not be discharged more than 50% of their total capacity per charge/discharge cycle. Discussion 5: There are well established approaches to calculate the average daily load a boat will have. Each boat and owner is unique. Different boaters have different lifestyles aboard. Some live on the boat as if they were “camping out;” others want “all of the comforts of home.” Some boats are used infrequently; only a few hours per year in local day or weekend outings. Others are used hundreds of hours per year in long distance cruising. Some boats rarely leave their home mooring and shore power; others are rarely connected to shore power. But for all battery systems, the rule-of-thumb applies. Deep-cycle batteries should be used in “house/inverter” applications, and should not be discharged more than 50%. Lesser average depth-of-discharge (DOD) is better. One study of Lifeline batteries suggests the best lifetime return (ROI) of amp hours occurs at the 40% average DOD level. Each boat owner will need to confirm the battery capacity necessary to maintain that average discharge. I would note here that rare – RARE – deep discharge will not hurt service life, provided batteries are immediately and fully recharged. Even though alternating between 30% DOD and 70% DOD averages to 50%, frequent discharges below 50% DOD will shorten battery service life. Question 6: How do I keep track of state-of-charge of my batteries? Answer 6: Install a made-for-purpose battery monitor. Discussion 6: “Coulomb counters” are devices that have large shunts in the bank’s DC return line. They measure in real-time the amount and net direction of energy flow into and out of the battery bank. Coulomb counters must be pre-programmed to “know” the battery construction type and total amp hour capacity of the bank being monitored. The boat owner must then monitor battery use and recharge the batteries when that “rule-of-thumb 50% DOD” is reached. A new class of devices called “Capacitance monitors” report state-of-charge directly. They do not use shunts or install shunts in large diameter battery wiring. They pass a high frequency AC signal through the battery/bank from which they calculate both total amp hour capacity and internal resistance. Based on battery construction type, they read out SOC as a percentage, and require no complex user-setup programming. Most charger manufacturers offer coulomb counters as options. Balmar, Blue Sea Systems, Newmar and others also offer independent options. Question 7: Do I really need a battery monitor to monitor my battery’s SOC? Can’t I just use a DC voltmeter? Answer 7: A battery monitor is by far the preferred choice! Discussion 7: In general, the terminal voltage of a battery bank is a lagging indicator of SOC. This can often result in repeated but unintentional over-discharge or incomplete recharge of the batteries. Voltages that reliably reflect battery SOC are measured open circuit, batteries disconnected from the host circuit, after a period of an hour or more of “resting” to allow electrons to diffuse through the crystal matrix of the lead plates. That approach works in a laboratory environment, but is not practical on any boat that is actively in use. A made-for-purpose battery monitor is much more accurate than a DC voltmeter in tracking battery capacity. Question 8: Do I really need a multi-stage battery charger? Discussion 8: Single-voltage battery chargers are best used occasionally, and then primarily on start service batteries. They are typically regulated to produce 14.6V – 14.8V. Those voltages are way too high for all but the bulk phase of deep cycle battery charging. At that, they are only suited to be the target voltage for the bulk phase of charging, not a steady voltage. High charging voltage will permanently damage Gel cells, and can damage AGMs. During periods of over-voltage, excessive current flow in wet cells causes the batteries to gas and causes oxides on the plates of the battery to “shed” and fall to the bottom of the cell. Prolonged high charging voltage will result in damage to all batteries, and premature failure. Remember also, there are at least two separate and independent battery charging systems on most trawlers. One operates from shore or generator-supplied AC. The second is the alternator on the propulsion engine. BOTH OF THESE SYSTEMS SHOULD BE REGULATED, MULTI-STAGE CHARGING SOURCES. Few OEM engine alternators come with built-in multi-stage voltage regulation. 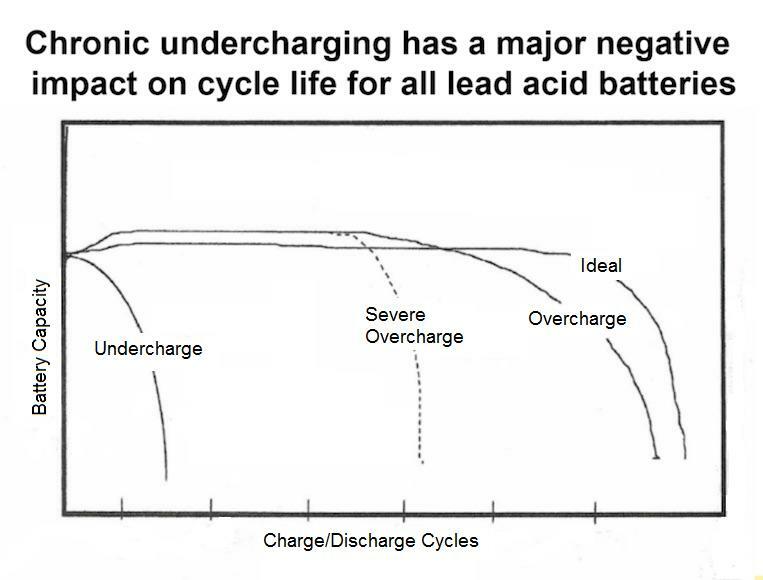 All lead/acid batteries have a “natural Charge Acceptance” curve. This curve is an “electrical property” of a battery, determined largely by battery construction type. All lead/acid batteries discharged to 50% SOC can accept charge fairly rapidly up to about the 80% state-of-charge level. The last 20% of charge can take more time to achieve than that first 80% step, but full charging is critically important to maximizing lead/acid battery service life. Full charging is recommended by most battery manufacturers at least bi-weekly (fortnightly). Multi-stage chargers are designed to take advantage of the natural charge acceptance characteristics of lead/acid batteries. The initial period of rapid charge acceptance is called the “bulk” stage, followed by a period of slowing charge acceptance called the “absorption” stage. When a battery is almost fully charged, a multi-stage charger will go into its “float” stage. To the human observer, it’s fairly easy to see that point between bulk and absorb, because that’s when flooded wet cells begin to visibly, actively and aggressively produce hydrogen gas. Outgassing is always considered ‘bad” for lead/acid batteries, and multi-stage battery chargers are designed to switch to float in order to minimize the conditions that cause gassing. This is particularly important for AGM and Gel batteries, because replacing liquid electrolyte in these batteries is not possible, and gassing will permanently damage these batteries. Question 9: How do I decide how big my battery charger needs to be? Answer 9: Balance between battery bank capacity (in amp hours) and charger cost. Discussion 9: One of the many electrical characteristics of batteries is the rate at which the battery can accept charge. This is called Charge Acceptance Rate (CAR). Boaters will frequently read in advertising and on the Internet that flooded wet cells have a CAR of 25%. What that means is flooded wet cells will accept a charge measured in AMPS, that is numerically equal to 25% of the capacity of the battery/bank, stated in AMP HOURS. To illustrate the concept, assume the capacity of a flooded wet cell battery bank is 650 amp hours (a bank of 6 golf cart batteries). The CAR for that wet cell bank is equal to 0.25 x 650 aHr, or 162.5 amps. For AGM and Gel batteries, the “nominal” CAR is around 40%. So, an AGM or Gel battery bank of 490 amp hours capacity (two 8Ds) would have a CAR of 0.40 x 490 aHr, or 196 amps. For the average 40′ – 45′ trawler, a charger capable of between 100 and 150 amps is both functionally adequate and economically feasible for battery charging. It is EXTREMELY IMPORTANT to realize that these “rule-of-thumb” CAR numbers (25% and 40%, respectively) are the rate at which a significantly discharged battery can accept charge. As SOC increases, the Charge Acceptance Rate decreases. A battery at 80% SOC will have a CAR well below the nominal 25% or 40% numbers. Furthermore, it’s actually better for lead/acid batteries to charge at a rate that is slightly less than maximum CAR. The reason is technical. As charging voltages are applied to a battery, charge builds up on the surface of the lead plates. It takes time for electrons to diffuse into the interior structure of the crystal matrix of the lead plates. To the extent electrons accumulate on the surface of a battery’s plates, the battery appears to be at a higher SOC than it actually is. If the battery charger has too large a charging capacity, it can switch charge stage prematurely. If that happens, batteries can be chronically undercharged. This allows sulfation to accumulate and results in shortened battery service life. So, for trawlers and other power boats that run their engines continuously, it’s better to charge at a slightly slower rate than the maximum theoretical rate. Question 10: Do different boats have different battery charging needs? Discussion 10: Many trawler owners have previously enjoyed sailing. Sailboats motor out of the home mooring to the sailing field, sails are deployed, and engines are shut off. At the end of the sail, the engine runs for only a short time while returning to port. Thus, sailboat propulsion engines have very short duty cycles. During the time sailboats are under sail, their navigation instruments and lighting are supported by their batteries. With trawlers, propulsion engines run continuously (well, we hope they do). Under way, trawler navigation equipment and lighting – and the batteries themselves – are supported by the output of the engine alternator. Rarely are batteries actually called on to provide power. Sailboats cruising the ICW probably have engine duty cycles more similar to that of trawlers. Anyway, sailboats that actually sail have very different battery charging requirements from trawlers and other cruising power boats, and the requirements of one does not generalize well to the other. For sailboats that sail, when the engine is running, alternator output must be absolutely maximized, and typically operates in bulk mode. For trawlers, battery charging is much more complex, and must automatically adjust to the changing requirements of the batteries during the overall charging cycle. Discussion 11: There are many considerations in this question. There is no “one-size-fits-all” answer. My net is, for those who use their boats a lot, and prefer anchoring to staying in marinas, flooded wet cells provide the best ROI if they are charged and maintained properly. That is a big if, because the statistics do not suggest that many owners are disciplined about maintaining their batteries. Live-aboards and frequent use boaters are most likely to maintain their batteries properly. For those who cruise from marina to marina, rarely or never anchor out, use their boats infrequently, or use them as floating winter condos in a marina in Florida, AGMs may be a good investment. In that use, batteries would rarely if ever be deeply discharged, and being maintenance free is an advantage to their owners. I wrote a post on my website, located here, that discusses these compromises in more detail: https://gilwellbear.wordpress.com/category/boat-technical-topics/electrical-topics/battery-topics/which-batteries-are-best/. Question 12: Can lead/acid batteries freeze? Discussion 12: If a lead/acid battery is partially discharged, the electrolyte may freeze. At a 40% SOC, the electrolyte solution will freeze at around -16ºF. When a battery is fully charged, the electrolyte will not freeze until the temperature drops to around -92ºF. While few boats will encounter either of these temperatures, it is always wise to keep batteries fully charged before storing the boat for the winter! This entry was posted in Batteries - Questions and Answers, Battery Topics on 2015/10/13 by gilwellbear. Separate or Combined House and Start Battery Bank? The question of having a separate “house” battery and “start” battery or having a combined, dual purpose battery bank is largely a matter of personal preference. Each arrangement has pros and cons, and there is nothing inherently bad about either arrangement. Modest sized cruising trawlers have limited space for everything, including batteries. Sanctuary had never been used by her previous owners as a cruising boat. Her previous owners may have anchored occasionally, but their preference had been to use marinas. When they did anchor, they were clearly in “camping out” mode, not in “living normally” mode. So when we bought the boat, she was in her OEM configuration, fit with two 8D batteries aboard. One 8D was dedicated to starting the Cummins 4BT-3.9 propulsion engine. The other 8D was used to power house DC loads. In that configuration, the “start” battery was seriously under-utilized; and, the house battery was seriously over-utilized. There was a manual “1-Both-2” switch to combine the batteries, but using it effectively required human awareness and diligent attention. As I “wind down” toward bed time in the evening, I often fail most gloriously in the areas of awareness and diligence. So, Sanctuary’s configuration was a very poor arrangement in terms of commodity utilization and human usability. Starting the engine requires many amps for a very short period of time; perhaps 500A for 5 seconds or less. The battery needs to supply cranking amps (CA, CCA, MCA, Reserve Capacity) but not amp hour (aHr) capacity. High, short term demand is not the design profile of loading of a deep cycle battery. At the same time, a single 8D was not adequate to handle house DC requirements in cruising service, and we needed more energy capacity for house use (refrigeration, water pumps, space lighting, computer, TV/DVR). However, we did not have the space to install a third 8D battery. It was obvious that combining the two existing 8D batteries into a dual purpose bank was the alternative that returned the best utility for our situation. We ran with the two 8Ds combined into a single bank configuration for several years after that with no problem. Then the day came when that bank went casters-up. In the summer of 2012, both of the 8D AGM batteries failed, a week apart. We were cruising in New England at that time, not near our home port, familiar marinas or regular marine chandleries. Fortunately, a cruising friend offered us a mooring ball at his yacht club, and the use of his pick-up. I am no longer able to lift and move an 8D battery by myself, so we decided to permanently replace the 8Ds with 6, 6V Golf Cart batteries, wired in a series-parallel configuration, to support our 12V DC system. The yacht club where we were moored allowed me to pull up to their dock (they were closed on Monday), where I loaded the batteries and spent the afternoon fabricating battery cables. I made up 8″ intermediate cables to make the series connections, and buss cables to add what was effectively a third 12V battery into the bank. The resulting bank occupied the same floor footprint as the 2 8Ds had needed. Anyone who wishes can download an Adobe .pdf copy of this diagram by clicking this link: 20161022_dc_electrical_distribution_system. A combined battery bank also solved several related problems, including the proper charging and load balancing on the two batteries, while giving us the additional house capacity we needed. So that’s how we have run for the last several years. We think it has been a net gain in several respects. We think there is nothing inherently bad about having a single bank that feeds both the house loads and starts the engine. For a combined battery bank, however, there are two clear cautions: 1) the bank must be big enough so that when it is discharged to the 50% point, it can still easily start the propulsion engine, and 2) there must be a reliable and convenient means to track the state-of-charge of the battery bank to avoid deep discharging to more than 50%. Fortunately, several battery monitoring products are available that enable reliable, accurate battery monitoring. Meeting these two requirements is therefore quite easy and relatively inexpensive. There are, of course, only two backup options to a severely discharged/dead battery bank. One is to run a genset to re-charge the bank, and the other is good towing insurance. If the genset option fails, the final option is to call for a tow. Our genset does have its own stand-alone start battery. The genset charges its own start battery when it is running. We also have a small, stand-alone external AC charger for the genset start battery. We use it periodically – not continuously – when we are docked for extended periods of time. That keeps the genset start battery conditioned and compensates for self-discharge. This entry was posted in Battery Bank: Separate vs Combined, Battery Topics on 2013/01/13 by gilwellbear. On boats, there are two very different sorts of DC electrical loads. Electronic navigation equipment (VHF Radio, RADAR, Chart Plotter, GPS, AIS), navigation lights and space lighting, water pump(s), refrigeration, computer equipment and entertainment systems require relatively modest amounts of electrical energy over rather a prolonged period of time. Propulsion and generator engine starter motors, thruster motors and windlass motors require rather large amounts of electrical energy over very short-period bursts. Lead-acid battery options are manufactured to support the needs of both of these electrical load profiles. “Traction” batteries are designed to operate in a physically harsh environment and be relatively deeply-discharged many times. These batteries are intended to supply small-to-moderate amounts of power for long periods of time. Automotive and light truck “start” batteries are designed to provide very large amounts of energy (amperes) over short periods of time. They are not designed to be deeply discharged, and can be permanently damaged by deep discharging. A compromise in manufacturing technique is the “commercial” battery. These are often found in RV and marine applications to power house DC loads. They are not a true start battery, but they are also not a true traction battery: they are a compromise between the two. Battery manufacturers rate traction batteries in Ampere-Hours (aHr), which is a function of lead mass. Start batteries are rated in terms of Cranking Amps (CA), Cold Cranking Amps (CCA), Marine Cranking Amps (MCA) and Reserve Capacity, a function of lead surface area. These technical ratings lead to the very different profiles of electrical load the two very different battery-types are intended to support. These ratings also reflect the very different construction and materials used in these different purpose batteries. In the US, traction batteries get their aHr rating based on carrying a load from the fully-charged state to the fully-discharged state in a period of 20 hours. All lead-acid battery manufacturers recommend against discharging traction batteries to more then 50% of the battery’s rated amp-hour capacity. That means a 200 aHr overnight DC electrical requirement would have to have a minimum of 400 aHr of installed battery capacity. Batteries that experience a lesser average level-of-discharge will generally return a longer installed service life. Traction batteries that are discharged at a rate greater than their 20-hour rate are not able to deliver the full-rated aHr label capacity. Traction batteries are built with relatively few, but relatively thick, lead plates. Start batteries have a relatively greater number of lead plates than traction batteries, but the plates are also relatively thinner. This design difference gives start batteries a much greater surface area of lead from which chemical energy can be quickly converted into electrical energy. Traction batteries can be used in starting service, but generally need to be of larger capacity (and therefore, physically larger and heavier) than a made-for-purpose start service battery. There are two grades of traction batteries. The 4D and 8D batteries commonly used on boats and RVs are “commercial grade” batteries. They are used in commercial services to start engines on large trucks and in many types of construction equipment. They tolerate moderate amounts of mechanical vibration and offer large CCA capacities. They support a reasonable mix of starting and deep-cycle applications. Electric car/golf cart batteries are true deep-cycle batteries, again with thicker lead plates and electrolyte reservoirs that are deeper below the plates than their commercial cousins. Because of plate thickness, they release their energy relatively more slowly, but for much longer periods. The thickness of the lead plates minimizes sulfation, and improves plate remodeling during the charging process. Particularly in hard-service applications, these design elements extend their service life. First, I’d suggest avoiding all 8D form factor traction batteries, not because they’re inherently bad, but because they are very heavy. At 160# or so per battery, more for some, I can not handle 8Ds by myself without risking personal injury. When they fail – and they do fail – you need to be able to handle them yourself, because it won’t happen when you’re at your home slip with lots of help available! Two 6-volt GC2 form factor Electric Car batteries will easily fit in the same foot print as a single 8D, and will have very nearly the same energy capacity (measured in Amp Hours). Three GC2 batteries will “just fit” in most 8D battery boxes, so that would allow six GC2s in the same space as two 8Ds. If so, that will give you significant additional aHr capacity in the same space two 8Ds require. For example, most 8D batteries range around 225 – 245 aHr; a pair of GC2 batteries in series will result in a 12V battery in the range of 215 – 230 aHr. The technology choices for deep cycle “Traction” batteries (“marine”/”commercial”) boils down to the selection of “flooded wet cell,” “AGM” or “Gel” batteries. All three are lead-acid technology. Optima spiral-wound batteries are a special – and expensive – case of lead-acid AGM technology. Each of these technologies has pros and cons associated with them. Some of the pros and cons will carry personal value for some boaters, but not for others. Flooded lead acid batteries require regular maintenance. That means periodically checking and adding distilled water, and periodically equalizing them. Flooded lead acid Electric Car (Golf Cart) batteries are “commodities,” available everywhere in the world; even in the third world. Flooded batteries have relatively high self-discharge rates. AGM and Gel batteries may not be either available or affordable in many places, even in the US. AGM and Gel technologies are “maintenance-free,” meaning electrolyte isn’t lost in normal operation, but also can’t be added. AGM and Gel batteries generally can’t be equalized. (Some AGMs can, but that is manufacturer-specific, and the general rule is: not.) AGM and Gel can be mounted in any physical orientation, including standing-on-side and standing-on-end. AGM and Gel batteries are adversely affected by ambient temperature, Gel more than AGM, so mounting them in the engine room can result in shortened service life in some installations. Charging traction (deep cycle) lead-acid batteries – regardless of flooded, AGM or Gel – should be done with a modern 3-stage charger set to the correct charging program for the battery technology. There are lots of technical issues around battery charging which I’m not discussing here (see my separate article, here). Suffice it to say that a charger with a 100A – 125A DC output for a 675 aHr battery bank is a perfectly acceptable solution; not perfect, but a highly acceptable compromise from a lifetime ROI perspective. Flooded lead acid batteries are the least expensive traction batteries to buy (lowest capital cost). The commodity cost of lead has driven battery cost way up in the last few years. With the Chinese buying the entire world-wide reserves of lead ore, that commodity cost will probably continue to rise. My summer, 2012, experience was that I bought six, 6V EGC-2 batteries rated at 230 aHr in June/July, 2012, for $92 apiece, from Sam’s Club. At that time, a single Deka AGM 8D was $600. So I was able to buy 690 aHr from Sam’s Club for what I would have paid for one 245 aHr AGM commercial battery at Hamilton Marine in Portland, ME. Now, here following is the “religious” part of the battery topic. The real issue is, “what’s the best ROI on the battery technology selection you buy?” And the answer is, again, “it depends.” From the reading I’ve done and the experience I’ve had aboard Sanctuary since 2004, running 40K miles and 4500 hours engine hours, and anchoring out 1/2 to 2/3rds of the time while traveling, I am persuaded that if you are an active cruiser – if you actually use your boat, put many hours on it each year, and anchor out in preference to using marinas – flooded wet cells provide the best ROI. They are the least expensive to buy, and they return good charge/discharge cycle life. The Sam’s Club batteries with Duracell branding are manufactured by East Penn in the United States. They are the same batteries that you’d buy retail, for much more money, over the counter at NAPA or West Marine. Yes; literally the same batteries, save for the house labels, made by the same people on the same production line in Pennsylvania. My own personal experience with AGM batteries (Deka, the East Penn brand label) did not meet my desires or expectations. I have had two sets of Deka AGM batteries fail after only 3 – 4 years in service (less than 300 charge/discharge cycles). They were not excessively discharged in service. State-of-charge was monitored with a Xantrex Link20, later upgraded to a Magnum ME-BMK. Both of my battery chargers (Magnum MS2012 inverter/charger on shore power, Balmar 712110 alternator with Balmar ARS-5 voltage regulator on the main engine) are multistage chargers. The chargers used the correct AGM charging profiles. And when these batteries failed, they failed overnight, not slowly; no advance warning. They did not return the charge/discharge cycle life they should have been able to return, and at $600 apiece in 2012, I no longer feel they’re the best choice for our cruising profile for lifetime ROI. That said, for people who don’t use their boats much, for those who use marinas rather than anchoring out, etc., the AGM and Gel maintenance free batteries may be a good choice. These owners will get several years of service from the batteries. In these applications, it may not matter that they haven’t returned their rated cycle life. FINALLY, AVOID THE DISCUSSION OF “HOW MANY YEARS” PEOPLE GET FROM THEIR BATTERIES. THAT DOES NOT TELL YOU ANYTHING ABOUT HOW THE BATTERIES WERE USED IN SERVICE, OR THE NUMBER OF CHARGE/DISCHARGE CYCLES THE BATTERIES ACTUALLY RETURNED. One final “religious” argument comes up with comparing Sam’s Club batteries to high-end Trojans, Rolls Surette, Lifeline, Optima, or other “high-end” battery brands. Again, “it depends.” There is no denying those brands are excellent, well made batteries. They are also expensive to buy. If two boats have equivalent aHr battery banks, equivalent loads, and equivalent usage profiles, it is likely that these premium brands will, indeed, outlast my Sam’s Club batteries. However, the real question is, will they outlast them by the ratio of their purchase price to mine? If mine last 5 years, will theirs last 15 years? Unlikely, I think. So, my Sam’s Club batteries may well offer better ROI and lesser total-cost-of-ownership than those elegant premium brands. My trade-off opinion then is, for coastal cruising in the US, the Bahamas and Canada, Sam’s Club batteries are just fine. If you’re a blue water cruiser who’s going to circumnavigate and travel to places like Figi or the Marquesas, or cruise south of 60º S latitude in the Channel Islands or Straights-of-Magellan of Chili, well, maybe in that case the premiums offer more comfort and re-assurance to their owners. But I’m a mid-size trawler cruiser. Most single engine trawler owners are not going to circumnavigate, cross the Atlantic, or cruise the Windwards. So for me, Sam’s Club batteries are just fine for coastal and near-coastal cruising in the US, the Bahamas and Canada. Optima batteries are a variation of AGM technology called “thin plate pure lead” (TPPL). They return lots of aHrs per unit of weight and space, and are relatively more efficient (lower Peukert’s exponent) to charge than other AGM batteries. They are expensive to purchase, per aHr. The technology has great potential, but not for me at current consumer price levels. In automotive start service batteries, Sears Diehards are of this “spiral wound” TPPL design. LiON batteries are an entirely new and “emerging” battery technology. They deliver several times the amount of energy at 1/4 the weight compared to their lead-acid counterparts. LiON batteries (the lithium, iron, phosphate variant) are stable and safe in operation. Some early adopters have installed LiON battery systems and are getting very encouraging results. That said, in 2013/2014, I consider LiON systems as an emerging technology. The technology requires very different charging and battery monitoring equipment which is not compatible or interchangeable with lead-acid charging equipment or systems. LiON charging and monitoring equipment is currently (2014, 2015) only available from hobbyist and custom-developer sources. It is not yet available as a commercial product from a reliable equipment manufacturer with stated length-of-life expectations, reliability and quality standards and consumer product warranties. LiON batteries are currently quite expensive. Supplier sources and product availability are highly limited. My net is, for the average boat owner/cruiser, from the perspective of fit-up cost, lifetime ROI and in-service maintenance, I consider conversion from lead-acid to LiON technologies to be impractical at this time. Yes, it works. Yes, it is highly efficient. Yes, piece parts are available from specialty sources. But, significant technical knowledge is required to install and manage these systems. If an outage occurs, the necessary service knowledge is not yet generally available in the marine service industry. This technology undoubtedly represents the future, but not yet the present. PbSO4 (lead sulfate) precipitates out and deposits on BOTH the anode and the cathode. Free hydrogen (H+) from the sulfuric acid electrolyte (H2SO4(aq)) produces water (H2O(aq)) at the cathode. The concentration of free hydrogen (H+) decreases over time. The concentration of sulfuric acid (H2SO(aq)) decreases over time. The pH of the electrolyte (H2SO4(aq)) increases over time. Two electrons are transferred in the overall reaction. Both half-cell reactions go from left to right when load is applied to the battery. The half-cell reactions are different processes. For each mole of lead sulfate produced, two moles of electrons travel through the external circuit. During discharge, the “+” plate is the “cathode” (since the “+” plate material is being reduced). This entry was posted in Battery Topics, Which Batteries Are Best on 2013/01/13 by gilwellbear.